The client’s of Red and White Pines requested a home integrated in the surrounding forest. The clients intend to manage the mature Red and White forest as a retirement plan and the house is intended to be the central point of this activity. Designed using Passive House standards to reduce the energy requirements of the house. Situated within a clearing of mature red and white pine trees. The house is located to make efficient use of available solar exposure and allow the coniferous trees to provide winter protection. It is important to ARCA-VERDE to arrange the house so that it does not appear large. The forms and sloping roof-lines serve to reduce the presence of the structure. The result is an expression that is elegant and unimposing. 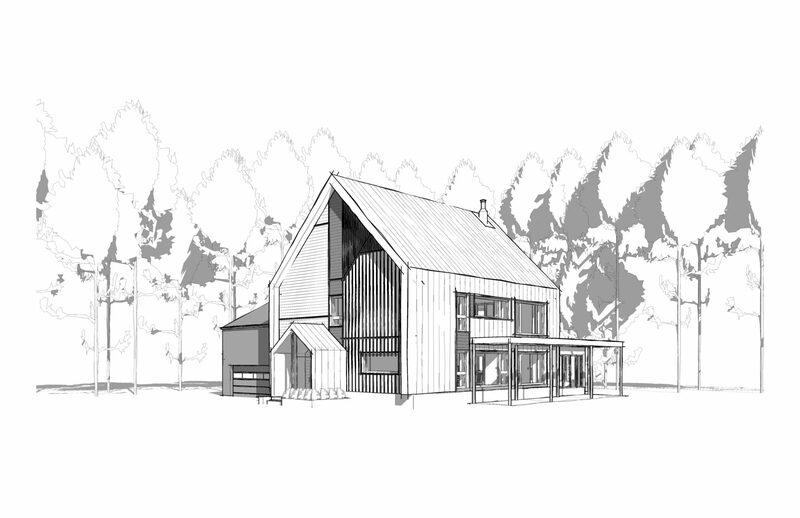 The house is composed of a 2 volumes; one, presented at front is a result of the Passive House envelop; the second, garage volume contains storage for the house and machinery for forest management. The open concept plan creates the intended expansive interior views, which allows maximum penetration of natural light and offers few obstacles for natural ventilation. However, the planning presents areas of repose and isolation. In either the spa-inspired washrooms, private master bedrooms (2) or the den space on the 2nd level, each space aims to be a place to seek independence or recharge when needed. It is an ARCA-VERDE desire that all technology within a house have little to no presence. This can be difficult with sustainable ideals but by allowing the architecture to be the first response, it is achievable. Rather than relying on technology or equipment to heat, cool and ventilate the building shape, interior configuration and placement of windows is all that is required. The house shape promotes natural ventilation with low windows that allow air to enter the house and rise up to the higher windows on the opposite side of prevailing winds. The east-west long axis with large south facing windows allow the winter sun to heat the interior almost eliminating need for supplemental mechanical heat. This allows adequate natural light in all rooms. Carefully places windows connect interior to exterior allowing the surrounding tall pines to be part of the house interior. The development of three zones within the floor plan serve as the private, semi-private and public separations. The first being the first floor (semi-public section) with the dining, living and kitchen rooms. The second zone is the 2nd and loft storey (private). The third is the outdoor zone (public). The first zone is the formal zone while entertaining the dining room is large enough to host 6-8 people with comfort. The kitchen, designed to be the hub of the house, is modest in size but has a large amount of storage with the pantry area behind. The living room is a formal area with conversational seating. The second level has two generous sized bedrooms each with a walk-in closet and ensuite. One ensuite has shared access with the den (possible third bedroom). The functional layout intends to be void of formal circulation. Overlapping functions foster a creative and friendly environment without bolstering the house size. One wood-burning fireplace is located at center of floor plates to maximize their efficiency. ARCA-VERDE has considered every detail in the Red and White Pines Custom Home. The placement of functions and arrangement of space creates an economy of space. Designing with the environment in mind creates a home with a low impact on the earth, a bright interior, and reconnects occupants with exterior environment.